Setting yourself apart from the 45-degree, air-cooled population inhabiting cruiserdom is a difficult task. Style your V-Twin a bit too liberally and you attract only eccentrics while ostracizing the general cruiser enthusiast. Maintain conventional cruiser fashion and you’re just another dot in a Seurat painting of Harley-Davidson. Star Motorcycles designers managed a coup with the Roadliner S (and its Stratoliner brethren). While not quite as ostentatious as an Indian Chief and its iconic valanced fenders, you could slip a Star Roadliner S into the original, 1933 version of King Kong and no one watching the movie would be the wiser. 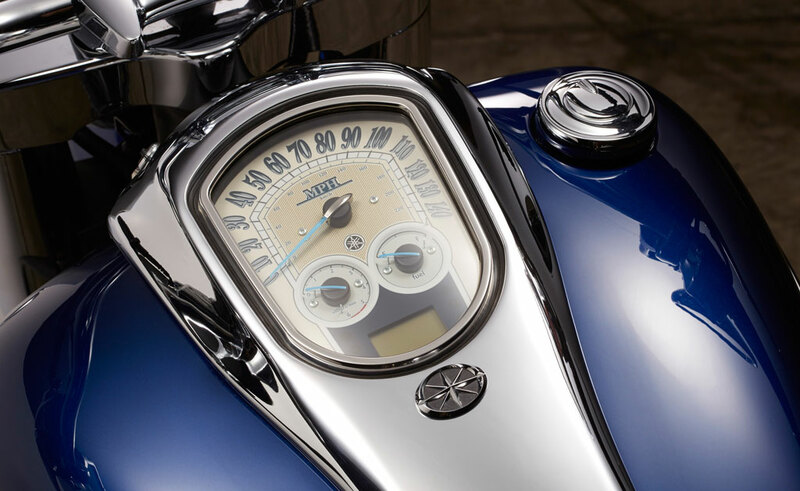 From its large, streamlined headlight nacelle to its tapered bullet blinkers and the stylized numerals of its speedo, the Roadliner S personifies Art Deco fashion. Not many cruisers, or motorcycles in general, can claim this attribute, making the Roadliner S unique. The Roadliner’s attractive instrument panel looks like an expensive wristwatch, although its low placement on the fuel tank makes quick reference difficult. Complementing its stand-apart styling is an air-cooled, pushrod Twin splayed at 48 degrees – while only a three-degree increase from the industry standard 45, it’s enough to be different while going largely unnoticed. The 1854cc engine is an attractive power plant with two pushrods inside each exterior tube actuating overhead valves. At the engine block the cylinders are narrow, expanding into large heads at the top – both with a jewel-like machining on the cooling fins. A small hiccup on its way to 103.5 ft-lbs of torque is the only blemish on this otherwise impressive chart. An early fuel-injected engine, chopping the throttle results in drastic engine braking, lurching rider and passenger forward. With a curb weight of 750 pounds the Roadliner isn’t exactly light, but the big cruiser carries its weight well. It feels substantial at freeway speeds but light on its feet when performing slow around town and parking lot maneuvers. Engine vibes are the same at idle as they are at 65mph, but anything above that speed begins stressing the five-speed transmission and giving the engine a busy feeling. Testers were constantly searching for a sixth gear when navigating SoCal’s freeway system. The wide saddle, pullback handlebars and “floating floorboards” provide a comfortable rider triangle. The heel part of the heel/toe shifter is independently adjustable – a very nice detail. 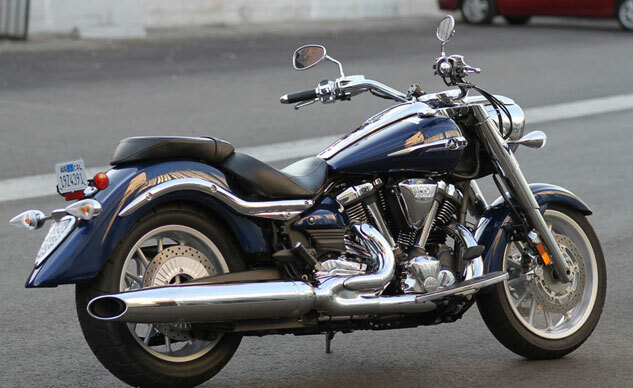 The hidden rear shock gives the Roadliner S a softail appearance. The 2014 Roadliner S features chrome on most unpainted surfaces including its handlebar clamps, engine covers, rear fender stays, front pulley cover, front brake and clutch master cylinders, belt guard and fork and fork covers. “Its switchgear feels like quality items, operating with an expensive, tactile feedback,” says Chief Editor, Kevin Duke. The flangeless fuel tank holds 4.5 gallons. 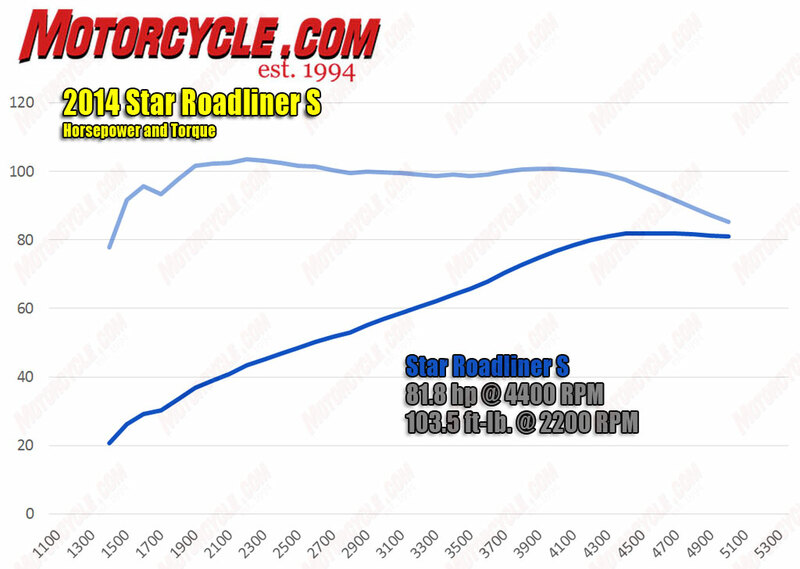 During our travels we recorded an average of 36 MPG (Star advertises 42 MPG), giving the Roadliner S a 162 mile range. 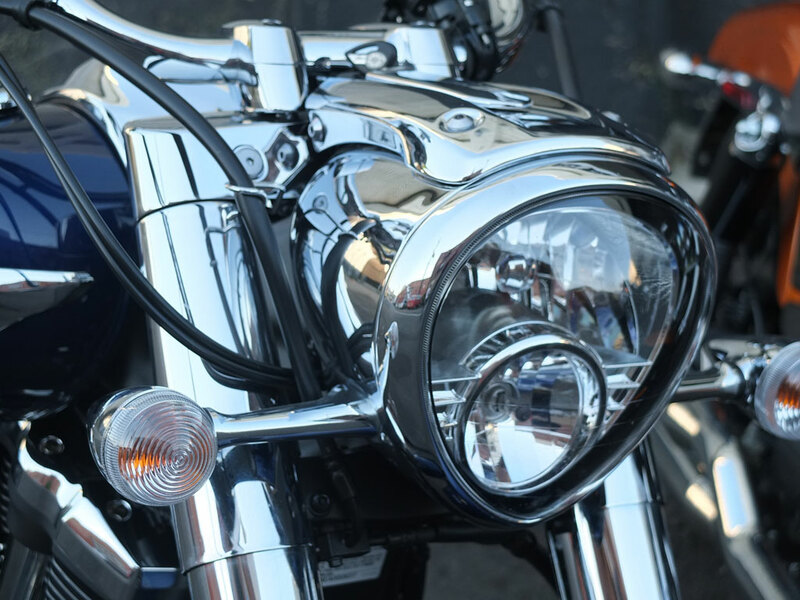 Handlebars are internally wired with electrical lines while the ignition features a slidable door for incognito concealment. 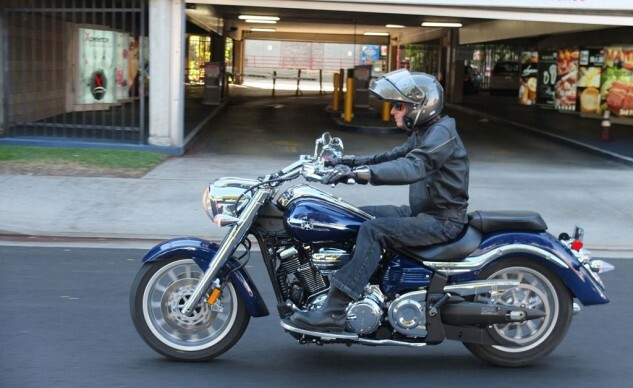 The Roadliner S rolls on an aluminum frame and a controlled-fill die-cast swingarm. The components are light while providing exemplary stiffness for handling cornering forces. Up front is a non-adjustable 46mm fork while the hidden rear shock is adjustable for preload only. Twin, monoblock calipers grip a pair of 298mm discs. Combined with the large, single disc rear brake, the Roadliner exhibits exceptional stopping power and feel. However, Star does not provide optional ABS for the Roadliner. In all, the $14,990 Roadliner S is an incredible value for a motorcycle with distinct style and impressive comfort and performance.